Experts in diagnosing and fixing faults in all automotive electrical systems. With almost 15 years experience as an auto-electrician, Leon and his team pride themselves on offering expert advice & top rate customer service at affordable prices. With superior knowledge and equipment to most mainstream dealerships, Telford Auto Electrics offers the best service for diagnosing and fixing auto electrical issues. An airbag light showing on the dashboard is a common fault and since March 2013 is an MOT failure. These faults are often easily rectified at little cost. This light often referred to as the MIL (Malfunction indicator lamp) is illuminated by the engine control module and indicates a fault with the engine's operation. An ABS warning light indicates a fault in your Anti-lock Braking System. Whilst the light is illuminated the system will no longer be able to stop the road wheels from locking up during heavy braking. This light is an indication that your vehicles charging system may not be operating correctly. 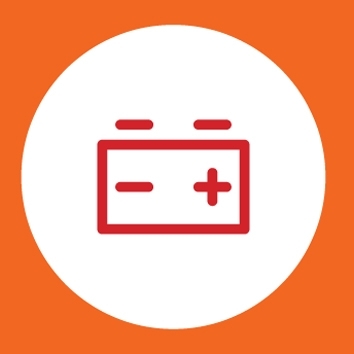 Our free battery and charging check will have you back on the road in no time. There are many different immobiliser warning lights, from a flashing red dot to a symbol similar to that above. A fault in this system will prevent the car from being started. We can diagnose, repair or remove these systems. Air conditioning not cold enough? A re-gas is recommended every 2 years, pop in and get your air conditioning re-gassed from just £65.